Made from heavy duty premium cowhide, the D.E.A.� is contour molded to each individual weapon. 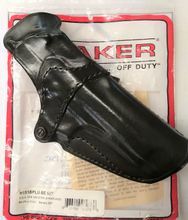 The reinforced holster mouth allows one-handed reholstering and use of full length SightStrip� protection insures a clean sight picture and smooth draw. Weapon retention is achieved by our unique molding process and a trigger guard tensioner. The belt loops securely fasten on to belts up to 1-3/4" with one-way snaps.